With less than three days to go before the latest deadline to avoid a government shutdown, Congress appears far apart on a deal to fund the government for the next six months (through the end of the fiscal year). And while President Obama has made clear his desire to avoid such a possibility, a shutdown is starting to look increasingly likely. Obama: Government shutdown would be "inexcusable"
Federal agencies are currently preparing for the possibility of such an event, but questions about the tangible impact of a government shutdown loom - particularly in terms of what it means for millions of Americans who are employed by or rely on the federal government for services. Below, Hotsheet takes a look at who and what would be directly affected by a government shutdown - who gets paid, who goes home, and whose blackberries go dark - and how that could affect the rest of us. In the event of a shutdown, the federal government does not actually stop functioning entirely: activities and employees deemed "excepted" (in 1995, the terminology used was "essential") to keeping the nation safe and operational continue to perform. Congress, along with President Obama, presidential appointees and specific judicial employees, are deemed "excepted" and not subject to furlough. Even those excepted federal employees, however, do not get paid until after the government resumes operations. According to a senior administration official who spoke to reporters in a Wednesday conference call, about 800,000 employees were affected by the shutdown in the government shutdown of 1995 - and a similar number of workers would likely be impacted were the government to close this week. So how do you know who keeps working and who goes home? Employers decide who is "excepted" and who gets furloughed - and the latter characterization could fall to any number of the 1.9 million civilian government employees. Plus, according to the Washington Post, "any workers scheduled to take paid leave would not be able to, and some would be eligible for unemployment benefits if a shutdown continued for more than a few days. Whether or not the furloughed staffers would get paid remains to be seen: they'd only receive back pay if Congress later passed a provision approving it - something that could take months and which may or may not happen. Additionally, a recent report from Roll Call indicates that some Congress members plan to limit their furloughs and keep their entire staffs at work. Social Security: Social Security recipients would be largely unaffected by a shutdown, according to the administration official. Checks for seniors, those with disabilities, and survivors would go out as usual. But Social Security Administration employees could face furloughs, but the agency is still finalizing its plan. Homeland Security: Critical functions, like border control, would continue. Mail delivery: The U.S. Postal Service is owned by the government but self-funded - so operations would continue uninterrupted. Air traffic control: As a function of maintaining public safety, Air traffic control would be exempt from a shutdown. Food inspection: Meat and poultry testing would likely continue, in accordance with federal mandates that those activities deemed "essential to ensure continued public health or safety" continue. National parks and monuments: As the New York Times puts it, "The National Zoo would close, but the lions and tigers would get fed." National parks and museums, including those on the National Mall, like the Smithsonian, would shut down - just in time for spring break. Passport operations: All operations would be likely suspended, except for in cases of emergency. 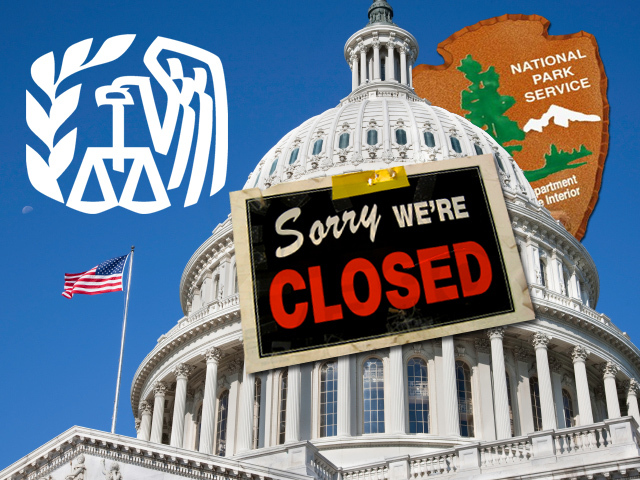 International Revenue Services (IRS): The IRs would close, but the April tax deadline would stay in place - so Americans would still have to pay their taxes on time. But according to the senior administration official, the processing of paper tax returns (which accounts for about 30 percent of all returns) would be suspended - as would refunds associated with those returns. The U.S. Small Business Administration (SBA): The SBA, which is dedicated to supporting small businesses, would suspend approval of applications for business loan guarantees, as well as direct loans to small businesses. The Federal Housing Association (FHA): The FHA would be forced to suspend approvals for new loan guarantees during peak home-buying season, according to the administration official. Medicare: According to the administration official, Medicare is funded for the short-term - and would likely remain unaffected unless the government were to remain closed for a period of months or more. NIH, however, will not be able to accept new patients or begin new clinical trials. Uniformed military personnel would continue to serve, but they would not get paid for their work until the government reopened. (Troops would get one week, not two weeks, pay in their next check, as the shutdown would go into effect in the middle of a pay cycle.) And a number of Pentagon civilians, State Department officials and USAID staff would likely be furloughed. Veterans services will largely go uninterrupted, as the Veterans Administration receives its yearly appropriation in advance and thus has the money to fund services for the rest of the year.